I get many requests asking what was the event around this photo. Also, who are some of the people in the photo. Here are some of the details. The photo was taken on September 9, 1931, at Comiskey park. 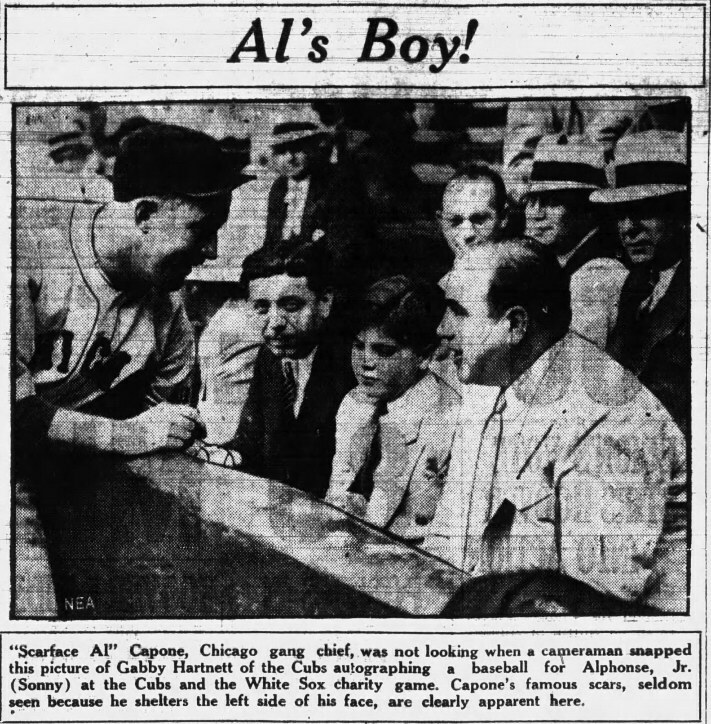 Al Capone took his son to the ball game. Not just any ball game. The game was between the Chicago white sox and the Chicago cubs. It was a game to raise funds for charity. The cubs won 3-0. In the top view you can see top row left ; Fred Pacelli aka Frank "Cowboy" Di Giovanni at right; Vincent Gibaldi, aka Machine Gun Jack McGurn . Front row: The real Albert Francis "Sonny" Capone. No, no stand-in as most think! Why in the hell would anyone fear for Sonny's life with the amount of bodyguards there. Also, rivals had a strict rule as to not hurt a single hair on the head of an opponents family. Rivals would never attempt something in a huge crowd like that. Sonny was a very shy boy outside his family comfort zone and having a hero player like Hartnett in front of him with the photographers made him real shy. It didn’t help to have all those torpedoes behind him attracting the crowd's attention. Capone brought him there to spend some special father and son time. Sonny probably didn't want the attention directed on him. Al wanted this quality time together because he had a sense that his upcoming tax trial might not go the way he is hoping. 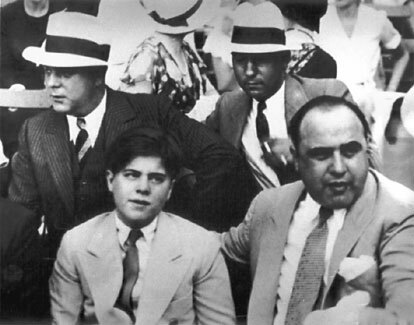 Even Senator Roland Libonati who was there had stated Al Capone wanted Libonati to speak to his son at that ball game. He had stated that in an interview. So why would Libonati speak to a stranger’s son when Al asked him to speak specifically to his son? What would be the point of making stuff up in later years? (Decatur Daily Review December 28,1957). Gabby Hartnett also defended himself to the commissioner saying he would sign that ball for any man’s son, yes, even Al Capone’s. Kenesaw Landis forbade Hartnett to no longer pose for photos with gangsters. Hartnett had supposedly replied to the the baseball commissioner that he can go tell Capone himself of this newly adopted rule. (Star Tribune May 20, 1932). The Petaluma Argus Courier September 25, 1931. So as far as the stand-in boy nonsense used to replace Al's real son, I've decided to prove it right here! I've taken a known authentic Sonny Capone photo from my private collection and cropped Mae all the while keeping Albert Francis "Sonny " Capone. I've made a transparency of this photo and superimposed it on the famous baseball photo. Yep! It's Sonny alright! Click on Mae and Sonny photo below and keep your eyes on the nose, eyes, eyebrows and cheek bones. They match up perfectly! In this shot at left, is the catcher for the Chicago cubs, Charles Leo "Gabby" Hartnett signing a ball. Hartnett, a Cub for 19 seasons, dies on December 20,1972, exactly on his 72nd birthday. Gabby was criticized for this gangster aimicable autograph display. The man next to Hartnett is Illinois legislator Roland V. Libonati. World war 1 veteran, He later becomes a congressman and after retirement, a lawyer in private practice. Mr. Libonati never shied of his friendship with big Al and once said about Capone "I liked him, because he respected me." Mr. Libonati died on May 26,1991 at the age of 90. The man in back of Roland Libonati with glasses and no hat is none other than Samuel McPherson Hunt, aka known as "Golf bag". This was noted by Chicago mob historian and author John Binder and I later confirmed it with Mr. Hunt's relative. See Sam Hunt on this webpage. Sam was knicknamed that after being arrested in Grant park, with a sawed off shotgun was found tucked in his Golf bag. The man next to Golfbag Hunt has yet to be identified. The next man, Fred Pacelli aka "Cowboy Frank" Fred Di Giovanni, was a Capone hood who was fatally shot at a Mortons Grove roadhouse known as The Dells. On June 15,1932, shortly after midnight (June 16), three bandits enter the roadhouse that is filled to capacity with three hundred guests. One of the bandits is carrying a gun. As a pair of the intruders approach an unarmed Pacelli, (Cowboy DiGiovanni) the 35 year old hood rises and is heard telling the intruder "Now, Bill, do you know what you are doing?" While saying this Cowboy tries to disarm the intruder. The intruder immediately strikes Cowboy in the head with the gun. The intruder and his friends all fire at Cowboy, totalling four shots. 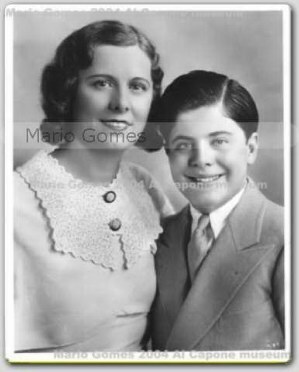 The intruder then points the gun at one of Pacelli's guests at the table with him, a 27 year old Miss Marjorie Bruce, accompanying Pacelli and her brother named John. Miss Bruce is shot in the side. Police come across one of the bandits, wounding and arresting him. He is Leroy Marschalk , aka Roy Marshank of Schiller Park. Marschalk is one of Roger Touhy's hoods, who is sent to get Di Giovanni on orders from the Touhy gang, for either booze or gambling faux pas. Some claim revenge or Touhy muscling in on Sam Hare's roadhouse for a share of the gambling profits, which was a long time Capone territory. Another theory was that Di Giovanni was a spy for George "Red" Barker, who was against the Touhys. Cowboy Frank had served terms in the Pontiac Reformatory for burglary in 1911 and 1917. It noted that the hood caught in the hit had also served time in the reformatory with DiGiovanni. DiGiovanni was accompanying Miss Bruce although he was married to a woman named Charlotte of 5242 Crystal street. At the time of his death, he was listed as living at 40 East Oak, which coincedentally, was also Miss Bruce's address. His wife Crystal, mentioned that Fred Di Giovanni was regularly employed as a salesman for a tailoring company and was fond of gambling. Fred Pacelli died at St. Francis Hospital in Evanston. **** Sam Pontarelli: the myth of a supposed Sonny Capone stand-in took root from Capone, The Man and the Era by Larry Bergreen. Right there should send up a red flag, but there's more. If you look at the index, next to Pontarelli's name is "pseudonym" - So Sam Pontarelli does not exist. We have no way of knowing if anything Bergreen attributes to "Sam Pontarelli" is true. Obviously, if that's not Sonny in the photo (which there no proof whatsoever that it isn't), it's not Sam Pontarelli either because there is no Sam Pontarelli. Bergreen's book is laden with many fairy tales, such as Capone being a bookkeeper in Baltimore, a cocaine fiend and for Capone being a gopher for Frankie LaPorte's Chicago Heights crew. No proven facts for any of these statements.